After years of dominating the tag team division on SmackDown Live, The Usos have made the leap to Monday Night Raw. The 6-time Tag Team Champions faced off against Bobby Roode & Chad Gable in their first match on Monday nights since the Brand Split began back in 2016. Roode & Gable put up a valiant effort, but Jimmy and Jey’s hard-hitting offense was too much for them to handle. After several superkicks and a pair of diving splashes, The Usos knocked off the former Raw Tag Team Champions. The duo will look to pick up the Raw Tag Team Titles, the only tag team championship they haven’t earned on the main roster, soon. Dunn Dunn Dunn Dunn Dunn Dunn Dunn Dunn Dunn Dunn (to the tune of Imperial March). Gotta love kevin Dunn ! Nice production values from WWE with this one. 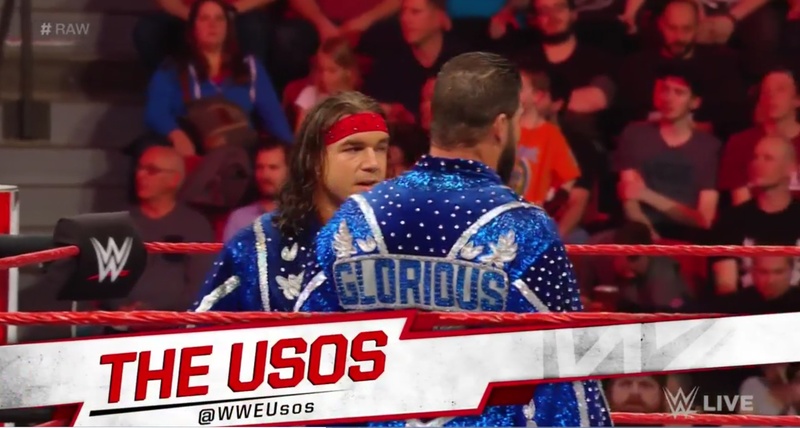 They actually messed up this surprise by putting up the Uso’s name just after Roode and Gable got in the ring … idiots.